Geoff Habiger and Coy Kissee have been life-long friends since high school in Manhattan, Kansas. Together they co-own the game company Tangent Games. Geoff had long had an idea for a crime novel set in a fantasy world – how would a police force work in a world filled with magic and monsters? 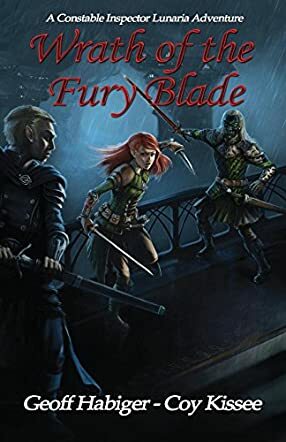 Wrath of the Fury Blade features a strong female protagonist who is at the peak of her career, but she has her flaws that we get to explore in the story. Coy lives with his wife in Lenexa, Kansas. Geoff lives with his wife and son in Tijeras, New Mexico. Wrath of the Fury Blade is their second book together. In Wrath of the Fury Blade (A Constable Inspector Lunaria Adventure) by Geoff Habiger and Coy Kissee, Constable Inspector Reva Lunaria from The Royal Tenyl Constabulary is trying to enjoy her day off when she is urgently summoned by her superior. First Magistrate Lavalé fey Avecath, the King’s foreign advisor, was gruesomely murdered. It’s a difficult task, especially when the Sucra － the King’s secret police and the Constabulary’s rival － is also working on the case. She also has to get used working with a new partner, Seeker Ansee Carya. When more prominent figures are killed in a short space of time, Reva and Ansee know they must act quickly to stop the murderer. It’s a crime story in the elven world. The spells and magical items that the characters use are constant reminders that this tale is set in a fantasy realm, although focusing on a couple of police detectives trying to catch a killer while dealing with red tape, some conflict in the office, and addiction. The world-building has enough detail and specificity that makes it believable, particularly when the system, social issues and struggles reflect the ones we have in our society. The plot is moderately paced in which the characters are given enough room and time to establish themselves for readers to relate to them. They also have enough time to interact with one another with good dialogue that is not laden with medieval language, something for which I’m most appreciative. These set a solid foundation and backstory that steadily build into the bigger events. The tenacious Reva is easily likable, despite her flaws, but I gravitated more towards Ansee Carya. His perseverance and sense of justice proved his worth as a Seeker and showed his strength of character. Overall, Wrath of the Fury Blade is an engaging crime fantasy read interspersed with conspiracies, a secret order, and suspenseful moments. I truly enjoyed it.